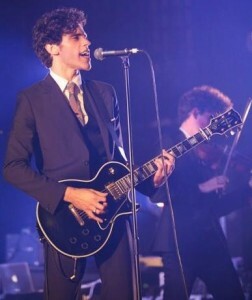 Charlie Fink displaying his new mature style at Brixton Academy. Photo by Alessio Paratore. 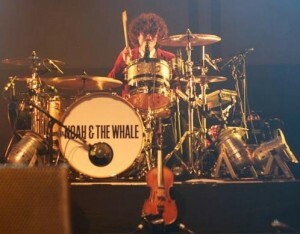 Noah And The Whale (NATW) lead by singer Charlie Fink, strolled on stage with suits to match their newly found ambition. It’s a far cry from the knitted jumper and checked-shirt days of their first album Peaceful, The World Lays Me Down that established the band as cult icons in 2008. 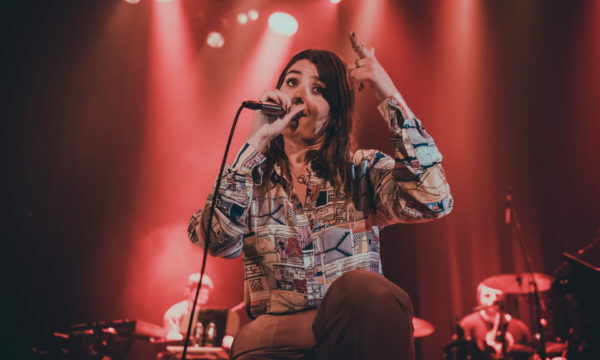 The only signs of their trademark indie folk roots are the full mops of hair and bearded faces bristling from beneath their neat collars – mimicked by the eagerly waiting fans. 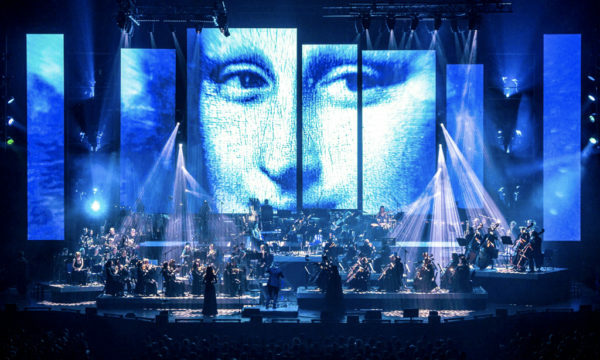 The third album is all about finding one’s self, and it’s no coincidence that NATW have undergone, or more accurately, are undergoing a transformation fitting with the album theme. To put it simply, they have grown up, or at least want to. 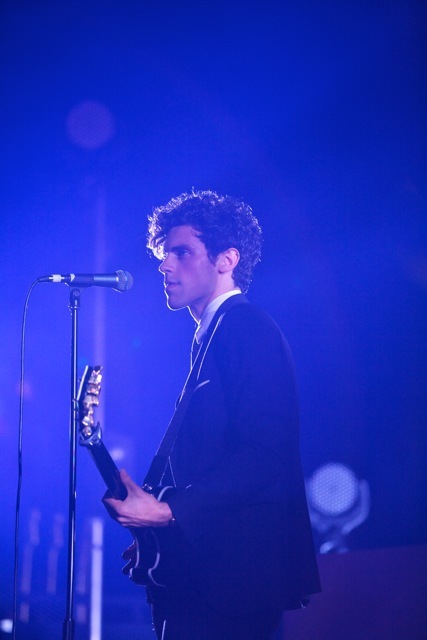 Lead singer, Charlie Fink’s black suit was matched with a curious accessory of confidence and stage presence. 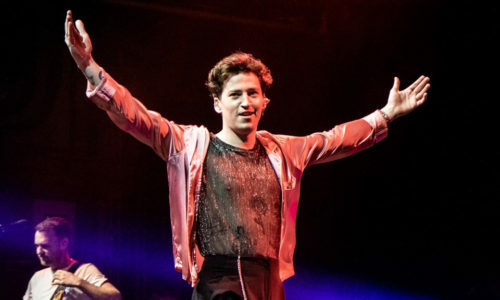 He played up to the crowd with the body language of front-man Brandon Flowers, gesturing as he spoke as though to preach of his newly gained wisdom and establish the band’s developed style. 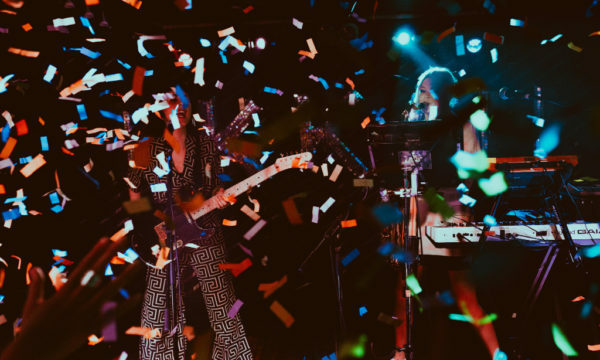 Their new adult attitude is only really evident on stage as their recent single releases such as Tonight’s The Kind Of Night have, granted, been a commercial sound but still recognisable as NATW creations. 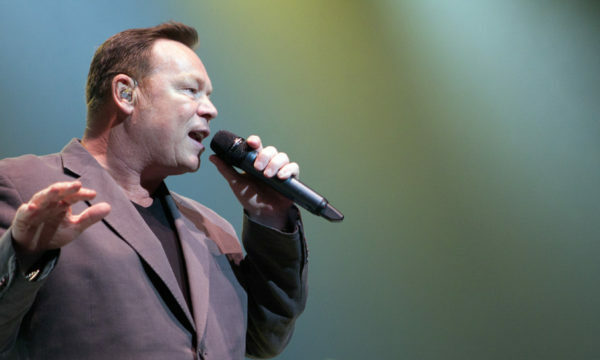 When performing on stage however, the band is tougher and louder, attacking once sensitive songs with a “this is a new-beginning” strength. The songs that made them one of the most promising talents on the folk scene back in 2007 seem to get lost in the urgency of their louder and fuller sound. 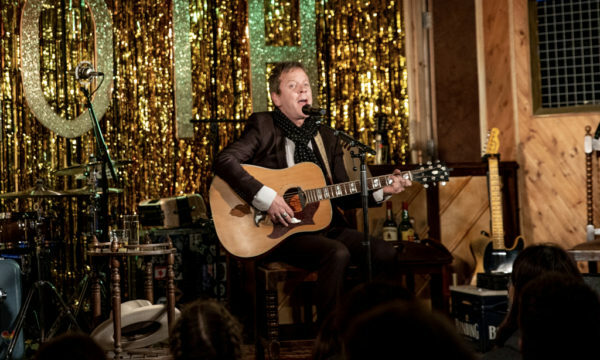 The acoustic classic of Shape of My Heart underwent heart surgery as the intimate lyrics were blasted on stage with a brutal enthusiasm and speed. Michael Petulla, the drummer NATW found via Gumtree. Photo by Alessio Paratore. Like all young adults there was an element of insecurity about this transformation. 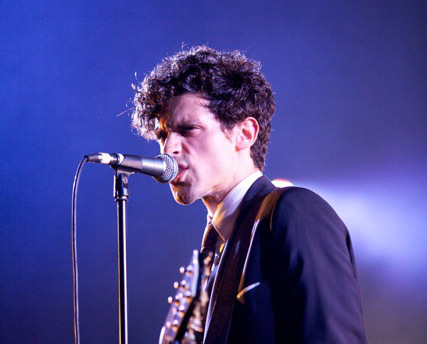 Charlie Fink performed with a nervous bravado and seemed at times unsure of his newfound confidence. Their past two albums, Peaceful, The Word Lays Me Down and The First Days Of Spring were a thorough and personal journey that fans of NATW warmed to, drawn to their vulnerable folky roots. 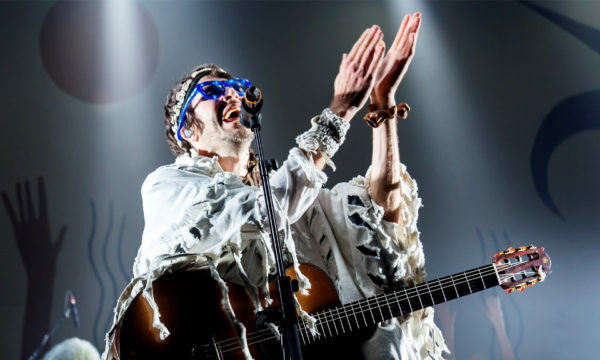 Since then, the music scene has been saturated with bands like Mumford and Sons and Villagers that have been created in the wake of a few pioneering artists. Noah survived the flood, but it seems like he has got himself stuck in muddy waters once again. 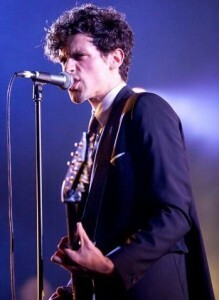 For the 2011 tour NATW’s celebrated album history is split into, as Charlie Fink explained on stage, “sections”. 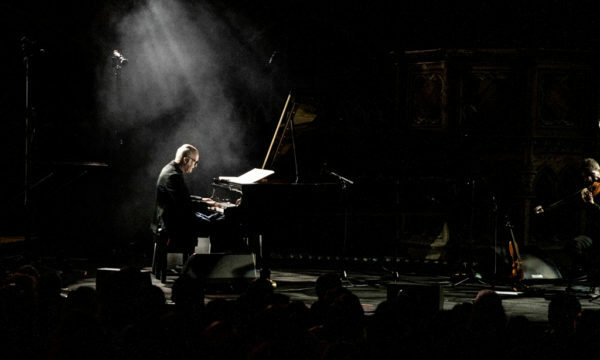 Their mission to classify their music was reflected in the unusual set-list structure that included, a middle “romantic section” and a final ‘”ively section”. It was an admirable way to show off the different elements to the band’s musical scope but unfortunately the “romantic section” (featuring the great bluegrass track Rocks And Daggers and the heartfelt story of Our Window), were lost in an audible muttering amongst the crowd who were apparently saving their energy for the chart hits of the ‘lively section’. A passionate performance. Photo by Alessio Paratore. It seems that Fink has gotten ambitious. Far more ambitious than just the need and want to pen down his thoughts and feelings, but to really take NATW on to a new level. 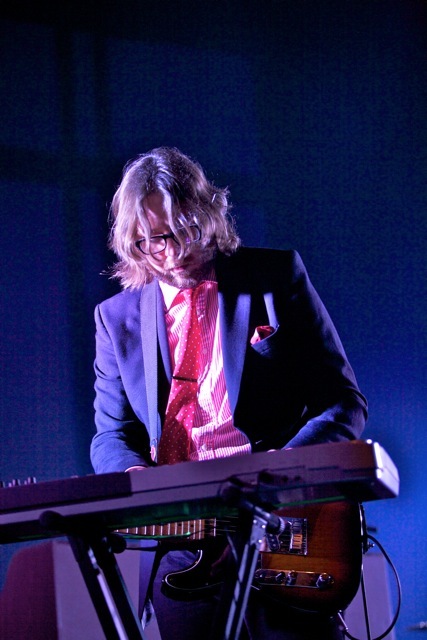 The band’s fresh live sound has led to the sensitiveness of the previous two albums to become lost. Their global success has created a sense that the band needs to be accessible for their new, mature, fan following. The adolescent introvert has been shed for a grown-up sound with more focus on guitar and catchy choruses. However, Fink may just be on to something. Despite the lull in the middle section NATW knew exactly how to win back the crowd. Doting fans, new and old, were equally satisfied by the pop-ed up content of new album, Last Night on Earth. By the time the ‘lively’ section was put in to play with old classic Five Years’ Time the crowd were undoubtedly having “fun, fun, fun”. This was quickly followed by a double whammy of two massive new releases: Waiting For My Chance to Come and L.I.F.E.G.O.E.S.O.N. 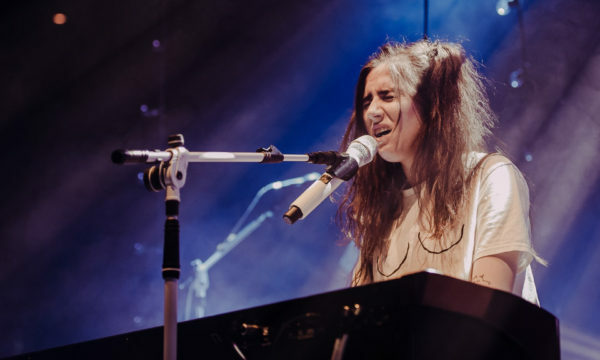 ­– to which the crowd burst into life again, chanting the lyrics back to the stage.